Lembongan Beach House is situated at the northern end of Jungut Batu beach with great views from the top deck of Shipwrecks and Razors surfbreaks. Lembongan Beach House is the perfect place for a few families or large groups holidaying together. You can watch the surf from the top deck or have a few drinks & watch the sun set over the ocean. Breakfast is not included but can be arrange upon request. Surf break Shipwrecks, at your door step. Nine bedroom, six bathroom beach house. . Sleeping up to 22 people. 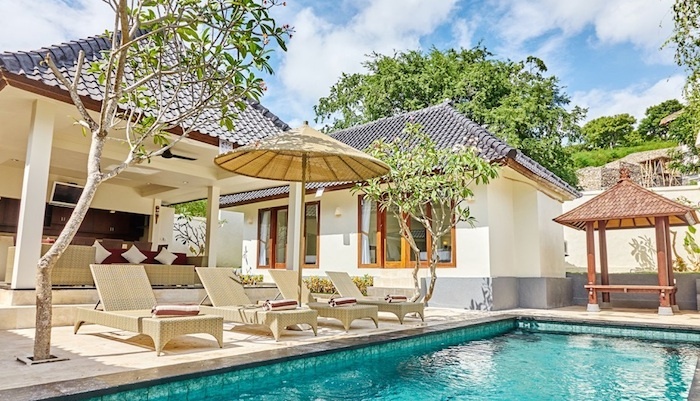 Lembongan Beach House is ideal for large groups so bring your extended family or a group of friends. The house can be separated into four living areas with two bedrooms each for when you need some quiet time as well as multiple outdoor living areas. Swimming pool with shallow end for toddlers. A pool table, ball games as well as stand up paddle boards and a three man canoe, will keep everyone entertained for hours! All bedrooms have air conditioning and ceiling fans. Breakfast not included however can be arranged on request.